The Android Nougat update has been hitting a slew of mid-range and budget Samsung smartphones recently, more than two months after Android 8.0 Oreo made its public debut, and the update has begun making its way to the Galaxy C7 this week. The update comes as a 1141 MB download over the air and bumps the phone’s build number up to C7000ZCU2BQJ6. Unfortunately, it looks like Samsung isn’t offering the latest version of Android Nougat and its Samsung Experience UX. The C7 is getting Android 7.0 and, therefore, Samsung Experience 8.1, which debuted on the Galaxy S8 and is now running two versions behind if we count the Oreo beta that has been available for the Galaxy S8 and S8+. This wouldn’t be such a big deal if the more affordable Galaxy J lineup of phones wasn’t getting newer software compared to the C7, although we’re guessing this is based purely on sales figures (the C series is too limited in availability and doesn’t hold a candle compared to the popularity of the Galaxy J handsets). In any case, Nougat is now available for the Galaxy C7 in China and is reportedly in the works for the C7 Pro as well. There’s no guarantee the C7 will get the Android 8.0 Oreo upgrade, but given the stiff competition Samsung is facing in the Chinese market, it would be in the interest of the company to keep consumers happy with more than just one major update. When will the android 7 come for Hong kong rum? Samsung hasn’t rolled out the Nougat update for TGY variant of C7, that’s absurd, I can’t understand why they can’t update both variants simultaneously, both are similar, the same model yet they have decided to roll out the update only for Open China variant. Samsung should consider this update mess seriously while all other companies update their phones with little to no delay at all, we have to wait whole year for just one small security patch!! 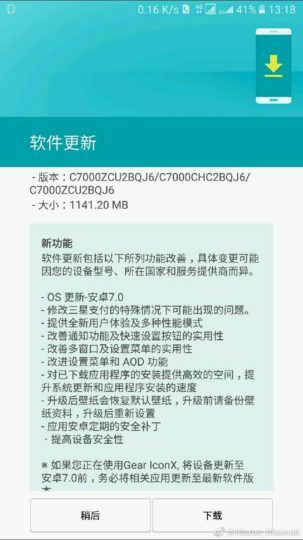 The last update TGY C7 received was in mid of June 2016. That’s not good at all!!! Finally a device of the Galaxy C series began to receive an update of Android. Curious this series to be even more devalued than the Galaxy J series. When come update Turkey ? When to update turkey ? When come nougat Turkey ?